Delphi will drive an autonomous car 3,500 miles across the country — from San Francisco to New York – in a coast-to-coast test-drive that will push self-driving car technology to its limits. 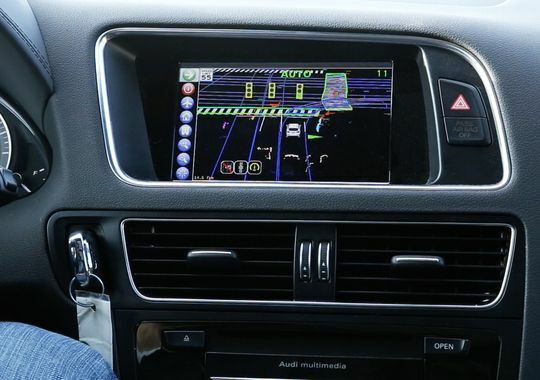 A team of Delphi engineers will leave California in an Audi SQ5 loaded with special cameras, radar and software on March 22 hoping to arrive in New York City during the first week of the New York International Auto Show. The car will travel for six to eight hours each day and will be tested by a team of Delphi engineers who will be watching the car’s performance closely. Companies both inside and outside the auto industry are experimenting with technologies that take more and more responsibilities away from the driver — right up to the act of actually driving the car. Most experts say a true driverless vehicle is at least a decade away. The car is packed with sensors and computers Delphi developed to replace humans: A camera in the windshield looks for lane lines, road signs, and traffic lights. Delphi installed a midrange radar, with a range of about 80 meters, on each corner. There’s another at the front and a sixth on the rear. That’s in addition to the long-range radars on the front and back, which look 180 meters ahead and behind. This isn’t Delphi’s bid to start selling vehicles directly to consumers. It’s in the business of developing things automakers don’t want to (or can’t) develop themselves, and the rise of autonomous driving is a fertile field of opportunities. This market, including active safety features (which do things like keep you in your lane, adjust your speed on the highway, and brake before you hit that cyclist you didn’t see) is growing 35 percent every year. It made Delphi $1.4 billion in 2014, a number the company wants to grow by 50 percent year over year. The test drive will give Delphi the opportunity to collect a tremendous amount of data that the company says will be invaluable as the industry explores various forms of autonomous vehicles. The potential for self-driving, or autonomous cars, has tantalized the automotive industry for several years.